A handout picture released by Iran's Defence Ministry on July 27, 2017 shows a Simorgh (Phoenix) satellite rocket at its launch site at an undisclosed location in Iran. Iran launched a satellite criticised by the United States as a breach of a UN resolution on Tuesday but it failed to reach orbit, the telecommunications minister said. Iran's arch foe Israel swiftly condemned the launch, which it charged was cover for the testing of the first stage of an intercontinental ballistic missile. "The Payam satellite was successfully launched this morning with the Safir satellite carrier," Mohammad Javad Azari Jahromi told state television. "But the satellite unfortunately failed to be placed in orbit in the final stage." The Payam (Message in Persian) and its launch vehicle had gone through successful testing of its first and second stages, the minister said. But in the actual launch, the satellite failed to reach the required speed on detachment from the rocket in the third stage. Both the Payam and its carrier were designed and produced at Tehran's Amirkabir University of Technology. University head Ahmad Motamedi said Amirkabir had already received an order for a replacement, Mehr news agency reported. Iran also plans to launch another low Earth orbit satellite, the Doosti (Friendship in Persian), Jahromi said. He did not give a date for the launch but said the satellite was intended to orbit the earth at an altitude of 250 kilometres (156 miles). "We will do our best to place it in the orbit," he said. 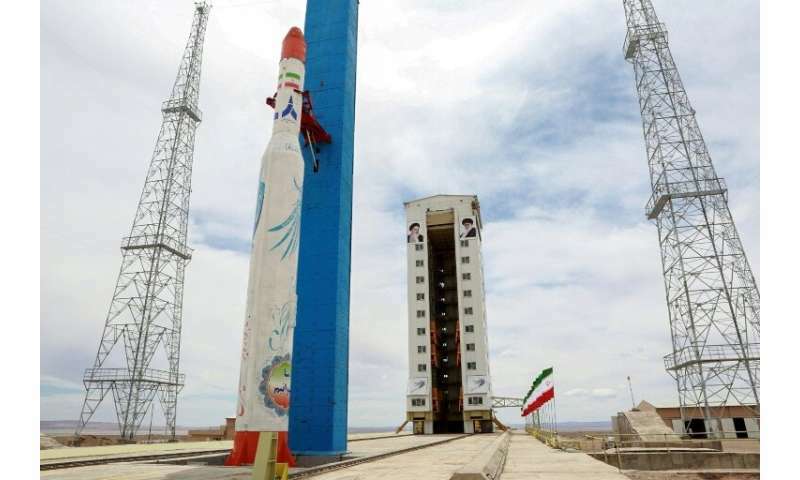 Iran has said repeatedly that its space programme, like its wider ballistic missile programme, is for scientific research and defence purposes only. The Payam and the Doosti were both designed to gather information on environmental change in Iran, President Hassan Rouhani said on Monday. "The satellite will give us all the information we need, and we will prove to the world that we are a country of science," Rouhani said. But Israel and its US ally both claim the space programme is cover for the development of longer-range ballistic missiles capable of delivering nuclear warheads. "Iran is lying now that it launched an innocent satellite to space," Israeli Prime Minister Benjamin Netanyahu said after the abortive launch. "It actually wants to achieve the first stage of an intercontinental missile, in violation of all international agreements," he told a ceremony in Tel Aviv for the investiture of new armed forces chief of staff, Lieutenant General Aviv Kochavi. "We fully support the United State's firm objection to this act of aggression," he added. Earlier this month, US Secretary of State Mike Pompeo said Iran's plans to send satellites into orbit would violate the UN Security Council resolution that endorsed a landmark 2015 nuclear deal between major powers and Tehran. Tehran reined in most of its nuclear programme under the deal, since abandoned by Washington last year, but has continued to develop its ballistic missile and rocket technology. Security Council Resolution 2231 calls on Iran to refrain from testing missiles designed to be capable of carrying a nuclear weapon, but does not specifically bar Tehran from missile or rocket launches. Washington says the space launches violate the resolution. Iran's satellite-delivery rockets use technology "virtually identical" to nuclear-capable ballistic missiles, Pompeo said on January 3. "The United States will not stand by and watch the Iranian regime's destructive policies place international stability and security at risk." Tehran denied the planned launch was a violation of Resolution 2231. "The satellite is part of a civil project with purely scientific aims, foreign ministry spokesman Bahram Ghasemi told the semi-official ISNA news agency. "Iran will wait for no country's permission to conduct such scientific projects." The Payam satellite, first designed over a decade ago, was initially expected to be launched on a foreign-manufactured rocket, project manager Mostafa Safavi told ISNA in an interview published just hours before the launch. "The Payam is a non-military satellite with a non-military mission but some countries, thinking that it could have a military purpose, showed no enthusiasm for launching Iranian satellites," Safavi said. "When they did not cooperate for non-technical reasons, the satellite's specifications were altered and made ready for a domestic launcher," he added. Iran has launched several short-life satellites into orbit over the past decade, including the Simorgh and the Pajouhesh.